Alta PWI-1 Water Injection System MINI - Dezod Motorsports Inc - Home of the automotive performance enthusiast since 2002. 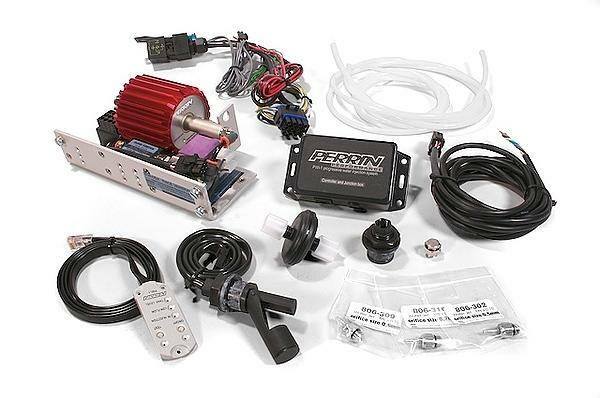 The ALTA PWI-1 water/methanol injection system is designed to suppress detonation caused by high intake charge temperatures and or when the effective compression ratio has been taken beyond the auto ignition point (of fuel) by increased boost from a turbo or a supercharger. To suppress Detonation, a fine mist of a mixture of water and methanol is injected into the intake charge. Water, with its high latent heat content, and methanol, with its high octane rating, are extremely effective at controlling the onset of detonation. From this you can gain power from increasing timing, or leaning the engine out, or simply add a large margin of safety to your engine. By adding an extremely fine mist of water you can effectively add an additional intercooler to your vehicle. This lowers charge temperatures, reduces any tendency for detonation, and thus greatly improves horsepower and torque. Most clients will see gains in excess of 20WHP once tuned for! All while increasing safety and longevity of the engine. The ALTA Performance PWI-1 Water Injection System includes everything you need for a professional installation. Simply provide your own bucket of water! With a dash mounted control and display you can activate or deactivate the system as well as monitor the water level, flow and perform tests of the entire kit. Additionally, the PWI-1 brain uses trim pots to adjust flow, and injection start. The brain incorporates several safety functions, which can detect when the nozzle is blocked, or water is low in tank. If this happens the PWI-1 brain can be set to cut boost, switch to a different map (ECU dependent), or turn on a light or any number of things you can come up with. These are features simply not found on other water injection systems. Easy to assemble and install. Includes hoses, mounting hardware, instructions, and tuning tips.